Think back to the last time you were in any given waiting area ... for example: waiting to be seated in a restaurant. You're sitting there with anywhere from a 5-20 minute wait. You look over and see this very attractive display case. It contains 33 compartments for business cards and 3 compartments for brochures. 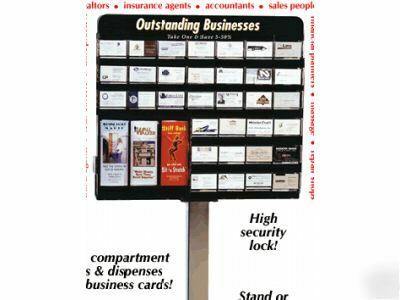 The sign on the top says, "Outstanding Businesses - Save 5-50%"
One of these cards is from a windshield repair shop just down the street. You remember that you need to replace your cracked windshield before your annual inspection coming up in three weeks. If you could save up to 50% on your windshield, do you think you'd take a card and at least give them a call? Who wouldn't? You can charge each advertiser an annual fee per location. For example: $120* (just $10/ month!) for business cards and $360* (just $30/ month!) for brochures. In this example, one filled Profit Center generates $5,040* annually! Now, imagine if you charged MORE than $10 for the cards and $30 for the brochures. Now just think of all the many locations available to you: ANYWHERE PEOPLE WAIT! Do you see the instant Cash Flow?! * This amount is calculated by charging $10/mo. for business cards and $30/mo. for brochures. In a nationwide survey informally conducted by Universal Advertising, we asked some of our recent Profit Center business owners how much they are charging per month for each compartment. Results from the 49 respondents are as follows: Business Card Compartments: 31% charge $10/mo. 69% charge between $11-$40/mo. Brochure Compartments: 10% charge less than $30/mo. 90% charge between $30-$75/mo. Universal Advertising makes no warranties, representation or guarantee that you will achieve the same or similar results achieved by the respondents in this survey or that the results achieved by these respondents reflect the average results achieved by all other Universal Advertising operators.